MINNESOTA, USA: 10 Things To Do With Your Kids On Human Rights Day on Dec. 10th! Make your own human rights tapestry! Human Rights Day is December 10! The date was chosen to honor the United Nations General Assembly‘s adoption on 10 December 1948 of the Universal Declaration of Human Rights (UDHR), the first global statement of international human rights principles. Here are some ideas for simple yet meaningful ways for your family to celebrate the rights and responsibilities that we all share as human beings. 1. 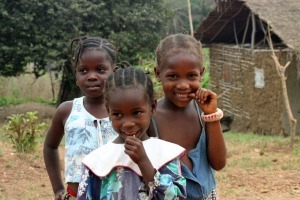 Learn about the Universal Declaration of Human Rights. Check out the UDHR plain language version or the Amnesty International UK book We Are All Born Free (15 of the illustrated pages of the book can be found on The Guardian’s website if you want to look at them online or print them out). You can also watch a short video together and talk about it with your kids. My kids loved this animated video version of the UDHR even back when they couldn’t understand what the words meant. For a more historical view, check out The Story of Human Rights. 2. Exercise your right to freedom of expression! Draw pictures together of the rights and freedoms that are important to you. You can make your own family “Human Rights Tapestry” by drawing on index cards and using a hole punch to make holes in each corner. Use yarn to tie together the cards to make a tapestry. 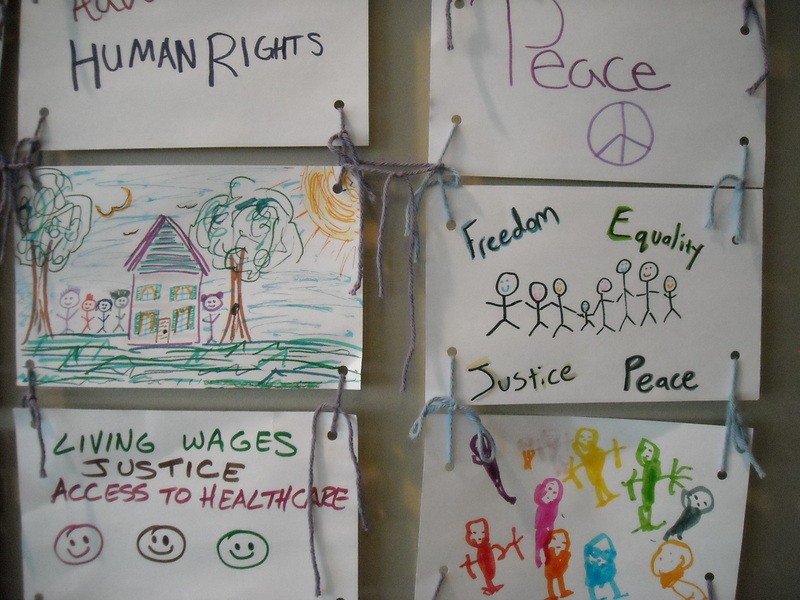 (See the picture above of the Human Rights Tapestry conceived of by Chanida Phaengdara Potter and created by visitors to The Advocates for Human Rights‘ booth at the Minnesota State Fair.) You can also make posters or collages together. Help your kids write a poem or story about human rights. Older kids can even make a video! 3. Listen to some human rights music with your kids. Here are a few suggestions, but you might also want to check out the folk music songbook Rise Up Singing. The book contains the chords and lyrics for more than the 1200 songs on a wide variety of social justice issues. 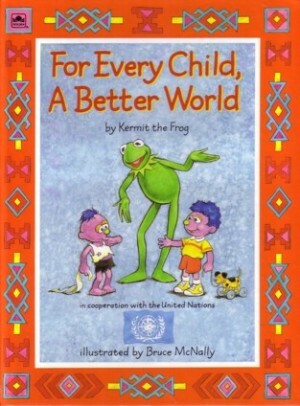 The Rainbow Connection – Kermit the Frog Someday we’ll find it! If I Had a Hammer – Pete Seeger Really, anything by Pete Seeger. Pete is my own personal antidote to Barney. Free to Be You and Me – Marlo Thomas & Friends In my opinion, one of the best things about being a kid in the 70s. The Preamble – Schoolhouse Rock Did you know that the U.S. Constitution is one of the first documents to establish universal principles of human rights? Star Wars Main Title/Rebel Blockade Runner – John Williams People say Star Wars was a Western set in space, but I see it as a movie about the fight for human rights against the Empire. Against All Odds Experience life as a refugee, for ages 7+. Stop Disasters! 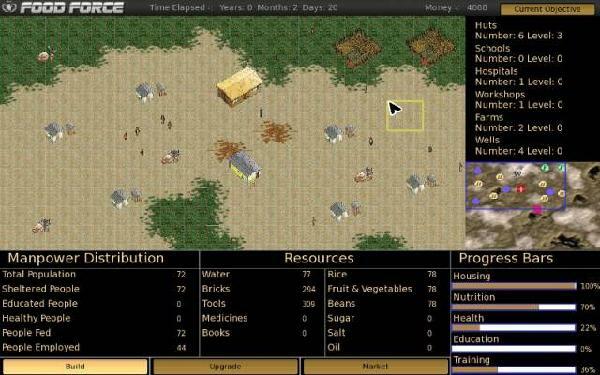 Learn how to respond to different humanitarian disasters. 6. Talk to someone you know who is from another country. Where are they from? What was their life like there? What language did they speak? Did they go to school? What do they miss? What do they like about their new country? 7. 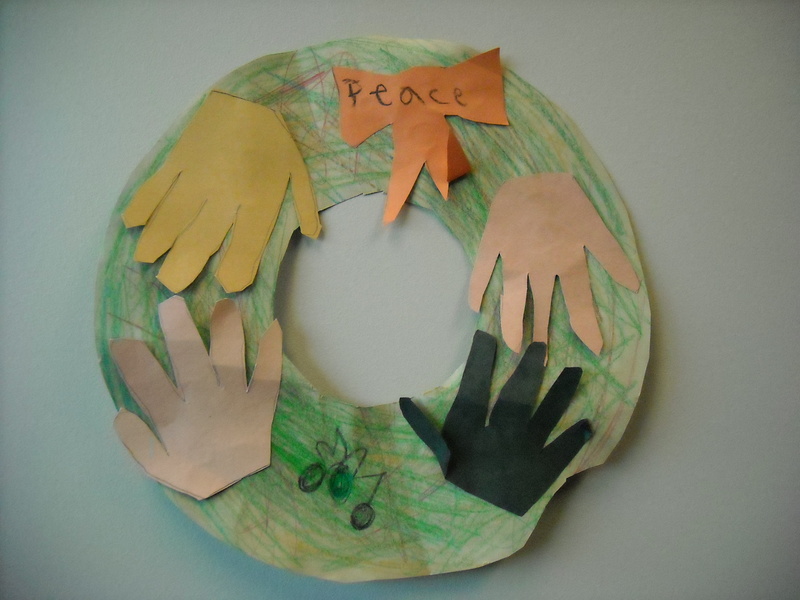 Make a Helping Hands Wreath to symbolize the responsibility we all have to help each other. Trace your hands on different color construction paper. Cut out the hand shapes and glue or staple them on a paper plate to make a wreath. 8. Act out a skit with puppets. You can use any puppets or even make your own paper bag or sock puppets. This skit is from RAISING CHILDREN WITH ROOTS, RIGHTS, & RESPONSIBILITIES , but you can also write your own skit, using a problem that your children have had to deal with themselves. Discussion: What do you think Jan could have done differently? Has anyone ever interfered with your play? How did that make you feel? “Can you do a different ending to the story?” Choose children to act out the play again with the puppets, but coach them in some respectful ways to play together to share, take turns, or use other solutions they think of themselves. “I know you can act very respectfully and responsibly toward each other. In fact, I’ve seen ________________________ (give examples of a time when acted responsibly). 9. Read a book about human rights. There are so many, but for young children, I like Horton Hears a Who by Dr. Seuss, The Giving Tree by Shel Silverstein, Giving Hand, For Every Child, A Better World by Kermit the Frog. Older kids may enjoy books more like The Hunger Games and Diary of Anne Frank. For more ideas for books for teens and tweens, see the Discover Human Rights resources, especially the Peace and Justice booklist and the Equality and Tolerance booklist. This is an original post to World Moms Blog by Jennifer Prestholdt of Minnesota, USA. Jennifer, an international human rights lawyer, can also be found on her on her blog, Human Rights Warrior and on Twitter @JPrestholdt. Photo credits of the craft ideas to the author. I can’t say enough about this post. I’ve ordered a used copy of the kermit book just now. I can’t wait to use this post and continue to reference it to do socially responsible things with my girls! Thanks! I’d love to hear the ideas that other moms have, too! Fabulous Fabulous POST!!!! I can’t wait to do some of these activities with my kids! I also want to put a link on my blog to this post as it is AWESOME!!!!! LOVE this! Great ideas for so many different ages. Thank you for sharing it with all of us. Thanks – it was fun to write! Hard to limit it to just 10 ideas, though.